Encased in Balmain, under the expert lenses of Emma Summerton, all three lasses looked extraordinary. 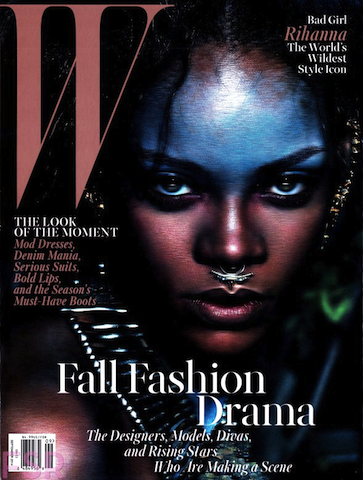 Rihanna gorgeously douses the cover and somehow manages to hold her own next to the industry’s heavyweights. Maybe her ability to effortlessly set trends has earned her the right to share the stage with legends of the runway. Designer Olivier Rousteng clearly relished working with his immaculate templates because the results reek of supreme opulence. PETA will definitely not approve but we can’t stop gawking at the vibrantly situated elements of FUR. Fall 2014 will be a chilly one, and nothing gets us excitedly prepared for the frigid temps than offerings from the genius behind the concept of “comfortably chic”. In the meantime we can revel in the reality that our three favorite fashion icon are striking a pose, simply for our benefit.